East 91st St. Marine Waste Transfer Station. Image Credit: Geoffrey Croft/NYC Park Advocates. A federal judge has dismissed an action brought by New York City residents challenging the re-development of a marine waste transfer station. On July 10, 2014, U.S. District Court Judge Paul A. Crotty (S.D.N.Y.) dismissed claims against the City and the U.S. Army Corps of Engineers, clearing the way for development of a marine waste transfer station at 91st Street and the FDR Drive. Between 1930 and 1999, much of the City’s waste was consolidated at a marine transfer facility jutting into the East River just off the FDR Drive at 91st street. In order to reach the old marine transfer station, Sanitation vehicles traversed an elevated ramp that bisects the Asphalt Green recreational facility and extends over the FDR Drive at 91st street. Use of the marine transfer facility was discontinued in 1999. After the City closed Staten Island’s Fresh Kills Landfill in 2001, the City began trucking waste to out-of-City landfills, thereby increasing costs and the risk of air pollution. In 2004, Sanitation announced plans to re-develop the 91st street marine transfer station into a 70,000 square-foot, ten-story operational facility. The new marine transfer facility was designed to cut costs and limit the City’s ecological footprint by allowing for efficient loading of sealed trash containers onto barges for transport to remote disposal sites. The new 91st street facility was designed as part of the City’s plan to comply with the New York State Environmental Conservation Law, which requires that the City submit a 20-year Solid Waste Management Plan every ten years to the State Department of Environmental Conservation. The City’s 2006 Solid Waste Management Plan focuses on transitioning from use of in-City landfills to environmentally sound transportation of waste for out-of-State disposal. New York State Assemblyman Micah Z. Kellner, along with Asphalt Green, joined with Sane Trash Solutions, a not-for-profit corporation comprised of local residents and community groups, to block the re-development. 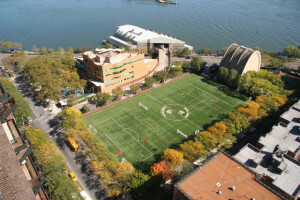 Before seeking relief in federal court, plaintiffs previously and unsuccessfully challenged construction of the 91st street facility through several New York State court proceedings in which they claimed private nuisance, illegality of Sanitation’s permit issuances and impermissible use of parkland. Plaintiffs also unsuccessfully contested State DEC’s decision to issue necessary construction permits without requiring the City to amend its 2006 Solid Waste Management Plan after delays in its implementation. In this last-ditch federal challenge, plaintiffs contested the rational basis for the U.S. Army Corps Of Engineers’ decision to issue a Clean Water Act permit, authorizing the City to discharge dredged material while constructing the 91st Street facility. Plaintiffs alleged that the Corps’ decision to issue the permit also violated the National Environmental Policy Act of 1969. This federal legislation requires that agencies take a “hard look” at the environmental consequences of and alternatives to their determinations, which Plaintiffs argued the Corps had failed to do. Plaintiffs further alleged that as a consequence of Hurricane Sandy, both the Corps and the City were required to supplement their environmental impact reviews, prepared by the Corps in compliance with NEPA and by the City in compliance with the City Environmental Quality Review Act and the State Environmental Quality Review Act. Finally, plaintiffs argued that the City had denied them equal protection of the law, as required by the Fourteenth Amendment and the New York State Constitution, in discriminating against them by siting the marine transfer facility near their homes. The Sane Trash Solutions Plaintiffs claimed the Corps’ complicity in the City’s equal protection violation and Plaintiff Asphalt Green brought claims against the City for breach of contract, trespass and private nuisance. Applying the Administrative Procedure Act, Judge Crotty found that the federal agency’s decision to issue a Clean Water Act permit was rational and, thus, entitled to judicial deference. Judge Crotty stated that plaintiffs’ long-term environmental concerns pertained primarily to post-construction operational matters within the jurisdiction of state and local agencies, to which the Corp had properly deferred. Accordingly, Judge Crotty ruled that the Corps had not abused its discretion in limiting the scope of its environmental review and had adequately considered and addressed activities covered by its Clean Water Act permit issuance, including project alternatives and environmental impact of construction. The Corps was not required to supplement its environmental review in light of Hurricane Sandy. Judge Crotty also ruled that Hurricane Sandy’s occurrence did not obligate Sanitation, as lead City agency, to supplement its environmental impact statement. Plaintiffs’ equal protection claim against the City was predicated upon Sanitation having exempted itself from its own siting regulations, which prohibited permitting new private waste transfers stations within 400 feet of residences, schools or parks. Judge Crotty ruled that the state court had already found these siting regulations inapplicable to City-owned or Sanitation-operated facilities and that the City’s selection of the 91st street site did not constitute intentional invidious discrimination against local residents. As for Asphalt Green’s private nuisance claim, Judge Crotty ruled that it too had been litigated and dismissed at the state court level as an impermissible collateral attack on the City’s environmental impact statement. Judge Crotty ruled that the Corps’ decision to issue the Clean Water Act permit was rational, well-supported and in compliance with applicable law, dismissing plaintiffs’ claims with prejudice. Judge Crotty noted that the new facility will be designed to function under negative air pressure in order to prevent the emission of trash and related odors.